UPDATED — AUSTIN, Texas (CNS) — The drama in Texas over abortion that drew national and international attention came to an end for the moment after the state House of Representatives then the state Senate voted to adopt tougher abortion regulations. Gov. Rick Perry signed the measure into law during a ceremony July 17. The law prohibits abortions in the 20th week of pregnancy, requires abortion clinics to be certified as surgical centers and increases regulations on doctors and abortion-inducing drugs. Jeff Patterson, executive director of the Texas Catholic Conference, said the law protects life by requiring no termination of pregnancies after the first 20 weeks and it improves standards for abortion facilities. The conference is the statewide association of the Catholic dioceses in Texas and the public policy arm of the conference’s board of directors — the bishops — that represents Catholic positions on issues before the Texas Legislature, the Texas delegation in Congress and state agencies. The stricter regulations for doctors and on use of abortion-inducing drugs such as RU-486 are to ensure they follow Food and Drug Administration guidelines. According to the Texas Department of Health, there were five deaths out of 937,818 abortions performed between 2000 and 2011. The last time a woman died from an abortion complication was in 2008. 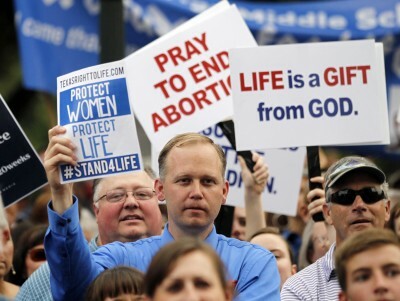 For pro-life groups, the legislation is another incremental step in ending abortion. In 2011, Texas legislators passed a bill requiring a woman seeking an abortion to receive a sonogram from the doctor who is to perform the procedure at least 24 hours before the abortion. This year’s legislation garnered national and international attention during a filibuster by Democratic State Sen. Wendy Davis of Fort Worth June 26, the last day of the first special session, thus killing the proposed bill. Perry then called a second special session and added abortion to the agenda. The Texas Constitution calls for the Legislature to meet biennially in odd-numbered years for 140 days beginning the Tuesday after the first Monday in January. Under the Constitution, the governor can separately call special sessions on subjects of his choice that may last up to 30 days. When pro-life legislation failed to gain traction during the regular session as lawmakers focused on the state budget and other matters, Perry decided to add abortion to his call for a special session that began hours after the regular session adjourned. After a series of delays allowed Davis to engage in a filibuster in the waning hours of the session, the measure died despite clear majority support. Perry called a second special session and again added the abortion legislation as an agenda item. 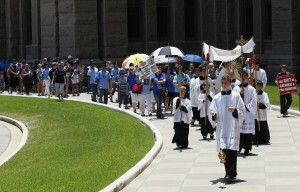 Marie Seale, director of the Diocese of Austin’s Office of Pro-Life Activities and Chaste Living, said the filibuster got the attention of pro-life supporters and brought them out to the Capitol in large numbers for the second special session. Seale said that pro-life supporters realized their presence was needed in large numbers and they were moved to take action. Although the church, the Texas Catholic Conference and other pro-life groups regularly ask people to make their presence known, this was a grass-roots effort to get as many pro-life supporters to the Capitol as possible. Laypeople got on Facebook and called on friends and other pro-life people they knew to show up dressed in blue at the Capitol. The challenge is now to keep the momentum going and Seale said the events made her realize how much work her office has to do. “Many women came forth with post-abortion stories,” she said. “They felt called to share how abortion affected them. That means Project Rachel has to grow. I’m hoping to pull people who are now on fire and get them involved.” Project Rachel is a diocesan pro-life ministry for those who are suffering from the spiritual and emotional trauma of abortion. Seale said the Gabriel Project, a diocesan ministry for women in crisis pregnancies, also will need to grow to meet the needs of the mothers and their babies. She said that many pro-life people who had not been politically active before now realize the challenge of getting legislation passed. The next legislative session is in 2015, and Patterson said pro-life groups want an end to judicial bypass, which allows girls under age 17 to forgo parental consent for abortions by getting approval from a district judge. Pro-life groups also want expansion and funding of crisis pregnancy centers and an end to regulatory requirements that prevent the centers from providing options other than abortion, as well as social services that will allow a woman to keep her child. Obregon writes for the Catholic Spirit, newspaper of the Diocese of Austin, Texas.